The Caddo are thought to be an extension of Woodland period peoples, the Fourche Maline and , whose members were living in the area of Arkansas, Louisiana, Oklahoma, and Texas between 200 BCE and 800 CE. The Wichita and Pawnee are related to the Caddo, as both tribes speak Caddoan languages. By 800 CE, this society had begun to coalesce into the Caddoan Mississippian culture. Some villages began to gain prominence as ritual centers. Leaders directed the construction of major earthworks, serving as temple mounds and platforms for residences of the elite. The flat-topped mounds were arranged around leveled, large, open plazas, which were usually kept swept clean and were often used for ceremonial occasions. As complex religious and social ideas developed, some people and family lineages gained prominence over others. By 1000 CE, a society that is defined by archaeologists as “Caddoan” had emerged. By 1200, the many villages, hamlets, and farmsteads established throughout the Caddo world had developed extensive maize agriculture, producing a surplus that allowed for greater density of settlement. In these villages, artisans and craftsmen developed specialties. The artistic skills and earthwork mound-building of the Caddoan Mississippians flourished during the 12th and 13th centuries. The Spiro Mounds, near the Arkansas River in present-day southeastern Oklahoma, were some of the most elaborate mounds in the United States. They were made by Mississippian ancestors of the historic Caddo and Wichita tribes, in what is considered the westernmost point of the Mississippian culture. The Caddo were farmers and enjoyed good growing conditions most of the time. The Piney Woods, the geographic area where they lived, was affected by the from 1276–1299 CE, which covered an area extending to present-day California and disrupted many Native American cultures. Caddo oral history of their creation story says the tribe emerged from a cave, called Chahkanina or “the place of crying,” located at the confluence of the Red River of the South and Mississippi River in northern present-day Louisiana. Their leader, named Moon, instructed the people not to look back. An old Caddo man carried with him a drum, a pipe, and fire, all of which have continued to be important religious items to the people. His wife carried corn and pumpkin seeds. As people and accompanying animals emerged, the wolf looked back. The exit from the underground closed to the remaining people and animals. The Caddo peoples moved west along the Red River, which they called Bah’hatteno in Caddo. A Caddo woman, Zacado, instructed the tribe in hunting, fishing, home construction, and making clothing. Caddo religion focuses on Kadhi háyuh, translating to “Lord Above” or “Lord of the Sky.” In early times, the people were led by priests, including a head priest, the xinesi, who could commune with spirits residing near Caddo temples. A cycle of ceremonies developed around important periods of corn cultivation. Tobacco was and is used ceremonially. Early priests drank a purifying sacrament made of wild olive leaves. Most of the Caddo historically lived in the Piney Woods ecoregion of the United States, divided among the state regions of East Texas, southern Arkansas, western Louisiana, and southeastern Oklahoma. This region extends up to the foothills of the Ozarks. The Piney Woods are a dense forest of deciduous and pinophyta flora covering rolling hills, steep river valleys, and intermittent wetlands called “bayous“. Caddo people primarily settled near the Caddo River. The Caddo first encountered Europeans and Africans in 1541 when the Spanish Hernando de Soto Expedition came through their lands. De Soto’s force had a violent clash with one band of Caddo Indians, the Tula people, near present-day Caddo Gap, Arkansas. This historic event has been marked by the modern town with a monument. Having given way over years before the power of the former Ohio Valley tribes, the later Caddo negotiated for peace with the waves of Spanish, French, and finally Anglo-American settlers. After the 1803 Louisiana Purchase, by which the United States took over the former French colonial territory west of the Mississippi River, the US government sought to ally with the Caddo peoples. During the War of 1812, American generals such as William Henry Harrison, William Clark, and Andrew Jackson crushed pro-British uprisings among other Southeast Indians, in particular the Creeks. Due to the Caddo’s neutrality and their importance as a source of information for the Louisiana Territory government, they were left alone. In the 1830s, the federal government embarked on a program of Indian removal of tribes from the Southeast in order to enable European-American settlement, as new migrants pressed from the east. In 1835 the Kadohadacho, the northernmost Caddo confederacy, signed a treaty with the US to relocate to independent Mexico (in the area of present-day East Texas). Then lightly settled by Mexican colonists, this area was being rapidly transformed by greatly increased immigration of European Americans. In 1836, the Anglo-Americans declared independence from Mexico and established the Republic of Texas, an independent nation. The name “Texas” is derived from the Hasinai word táysha, meaning “friend”. Congress passed the Dawes Act to promote assimilation of tribes in Indian Territory. It authorized distribution of tribal communal landholdings into allotments for individual households in order for them to establish subsistence family farms along the European-American model. Any tribal lands remaining after such allotments were to be declared “surplus” and sold, including to non-Native Americans. The allotment system was intended to extinguish tribal Native American land claims to enable admission of Oklahoma as a state and assimilate Native Americans into the majority culture. At the same time, tribal governments were to be ended. The territory had already been settled by numerous European Americans outside the tribal territories. The Caddo vigorously opposed allotment. Whitebread, a Caddo leader, said, “because of their peaceful lives and friendship to the white man, and through their ignorance were not consulted, and have been ignored and stuck away in a corner and allowed to exist by sufferance.” Tribal governments were dismantled at this time, and Native Americans were expected to act as state and US citizens. After some period, the adverse effects of these changes were recognized. The Caddo and other Native American peoples suffered greatly from the disruption of the loss of their lands and breakup of their traditional cultures. ^ “Enrollment”. Caddo Nation. Retrieved 21 March 2017. ^ a b c “Tejas-Caddo Fundamentals-Caddo Timeline”. Retrieved 2010-02-04. 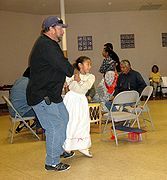 ^ “Tejas-Caddo Fundamentals-Caddoan Languages and Peoples”. Retrieved 2010-02-04. ^ a b c d e Meredith, Howard. “Caddo (Kadohadacho),” Encyclopedia of Oklahoma History and Culture, Oklahoma Historical Society, Accessed July 9, 2015. ^ Peter Kastor, The Nation’s Crucible: The Louisiana Purchase and the Creation of America,(New Haven: Yale University Press, 2004) 159-160. ^ “Art on the Prairies”. All About Shoes. Bata Shoe Museum. 2006. Retrieved 26 July 2015.